The onus is totally upon the husband to make his wife aware of her beauty by loving her - body and soul. 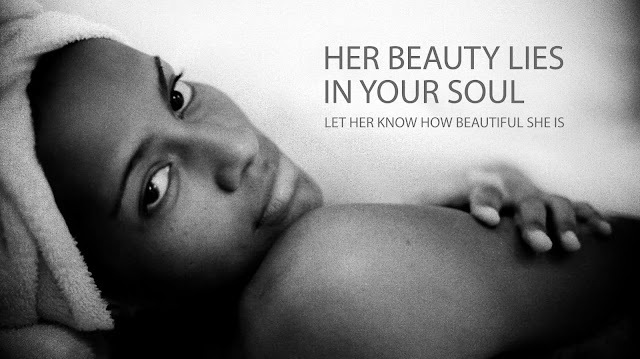 A husband must find out where his wife doubts her own beauty, it is precisely there he should love her tenderly, helping her to uncover and discover her own beauty. Authentic love seeks out beauty, finds her without blemish, and admires her thoroughly so as to get intoxicated by that beauty. This is the new wine - divine love - that Jesus restored at the wedding of Cana. The old wine of lust is now replaced with 'Agape' that ennobles 'Eros' - the pure desire for each other in man and women. Eros, in the absence of Agape turns lust. It is this pure nuptial love, uncorrupted by lust that we see and experience in the Song of Songs. The lover in the song exults “Behold, you are beautiful, my love, behold, you are beautiful! Your eyes are doves behind your veil. Your hair is like a flock of goats moving down the slopes of Gilead” (Song 4:1). As we know, God designed marital love to be the foretaste of our eternal union with God - the very union we await in the 'marriage supper of the lamb'. Marital intimacy points to the this profound union with God. In this union, God awakens us to see our own true, integral beauty, that we are yet to uncover. And it also enables us to see such beauty in everyone who is in communion with us. Church calls this experience the communion of saints. We all desire to experience love in such pure form. This is why we feel violated when we are cheated on by someone in our relationships. We have not lost our capacity to love as God loves. We can indeed grow beyond the corruptions of lust and this is precisely why Jesus came. He came to redeem our heart to love as He loves. He exhorts us saying "love one another as I have loved you", because He knows now we can. Our culture, marred by lust has misled us into thinking that we are not loveable because our bodies do not measure up to the images that are glorified as beauty by the world. Our faith is not in Jesus who redeems the heart but in cosmetics and creams that alter our bodies and defuse authentic beauty. The problem is not with our bodies but with out hearts. The magical elixir that opens our eyes to see our own beauty in its purest form is Jesus. One who is able to love himself, loves others. The scripture says "He who loves his wife loves himself" [Eph 5:28].